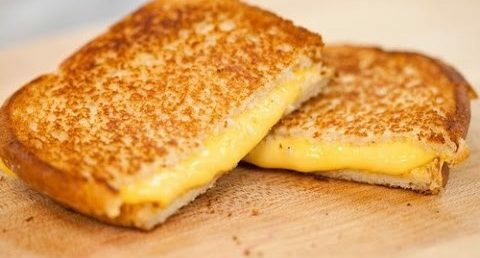 How to make grilled cheese? Grilled cheese sandwich is a wonderful thing to make that does not take much time and only three ingredients: butter, sliced cheese and bread. Do not make the mistake of adding less butter because some people do not understand the importance of coating the bread with fat. They love cheese and add a lot of it. Here is how you can make them perfectly. Step 1: Let the butter soften, you should not use a rock solid butter than you just got out from the freezer. You must wait till the texture of the butter softens and becomes easily for you to cut it off with a butter knife. Butter knives or butter spreaders are small in size and they make applying the butter easy. If you are using a regular spoon, you will be wasting butter and you will not be able to get all of it on the surface of the bread. Some people apply it with hand, but that will make your hands oily. Take a good amount of butter and spread it all over the surface of the bread. As you have two slices of bread, apply on one side of each piece. Do not make the mistake of covering both the surfaces with butter. Step 2: You will need slices of cheese. They are available in any supermarket. There are many kinds of cheese and the ones you are going to put in your bread are the processed cheese. They are best for grilled cheese sandwich and cheese burgers. The reason they are used for burgers and sandwiches instead of any other cheese is because when they are put over the right amount of heat, they melt properly. You should open the cheese and put two slices on two pieces of bread on the side where there is no butter. Step 3: It is time to put a pan on the stove. Some people think that they should put it on high or medium flame in order to prepare the grilled cheese sandwich. Just because the name is grilled does not mean that you put it on high heat. You will burn the bread pieces and the cheese will not melt evenly. The trick is to be patient and keep the bread with the side facing the butter on the pan on low heat. If one side is one, flip over the sandwich making sure it does not fall apart and cook the other side in the same way. It may take less time than the first one because the pan is already warm now. • You can serve them with French fries and if you are looking for a healthy alternative you can bake fries in the oven using sweet potatoes. You can sprinkle the fries with shredded Parmesan cheese. • If you are thinking about vegetables, go with pan roasted Brussels sprouts, all you need is them sliced and some Cheddar cheese. • Use only processed sliced cheese, not Parmesan or any other type. This entry was posted in Food on October 19, 2017 by Tom.